PolarisMail | Your E-mail Hosting Provider | We Know E-mail! With PolarisMail you will have e-mail, calendar, contacts, file sharing and editing – everything available on any device. Never run out of space with our 25GB mailbox and take advantage of extra storage space for your own cloud-based personal drive. Synchronize your data across the entire mobile ecosystem. Our technology allows your e‑mail, calendar, contacts and files to be synchronized to any mobile device. Do you need to collaborate with your peers? Share calendars and address books or use our online document sharing and editing facilities and increase your productivity. Choose our private e-mail hosting service to reach your clients with a professional e-mail address, using your own domain, and setup unlimited aliases to streamline your operations. 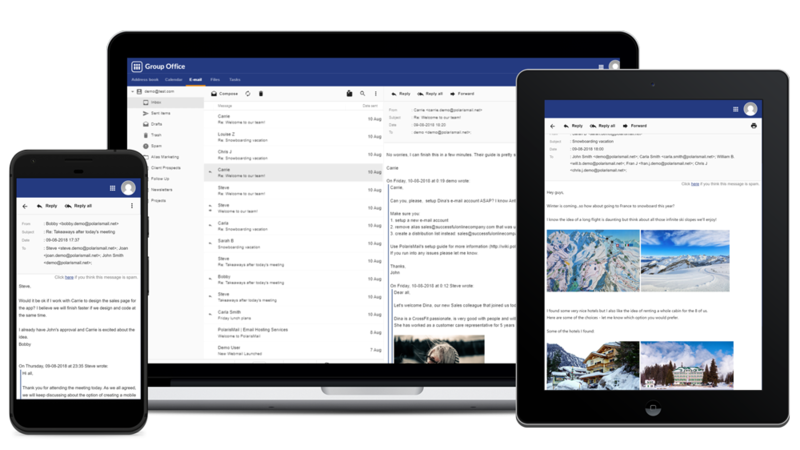 Collaborate even better within your team with our Enhanced E-mail Service and have all the tools you need for your day-to-day business activities. Edit documents in real time, send e‑mails and newsletters, share contacts, calendar and files with your colleagues while staying safe thanks to our advanced Anti-Spam & Anti-Virus Filtering system. Choose one of the three private e-mail solutions: PolarisMail Basic and Enhanced accounts and hosted Exchange. Create your own plan by combining these three options or choose one of our existing packages. Send campaigns with our e-mail marketing solution with features like: WYSIWYG editor, A/B testing, reports, bounce handling and top of the industry deliverability rates. 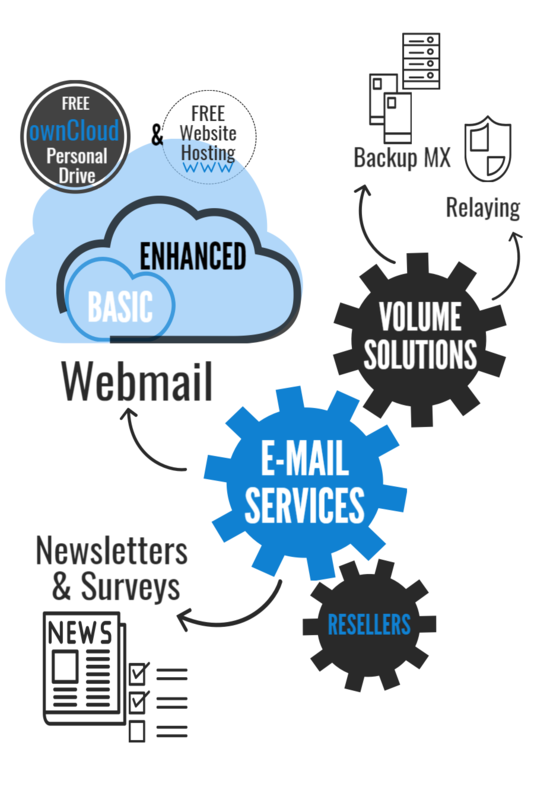 The Backup MX service is your insurance against downtime of your primary mail server. When your mail server comes back online we will deliver the messages to you. Our filtering solution was designed to facilitate communication among legitimate users while removing Spam & Viruses with an accuracy of 99%. You won’t run out of space with our 25GB mailbox and you can send and receive e-mails up to 50MB in size. This large limit will let you easily share your most important documents. We will help you move your domains, users and e-mail data with no downtime, no lost or delayed e-mails and free of charge. Your data is encrypted with 256 bit encryption to ensure its safety. SSL & TLS protocols are available and you can activate Two Factor Authentication for increased security. Collaborating with your team has never been easier: share e-mails, calendars, tasks, notes & files. Assign the users to separate groups and further control their level of access. For more than 5 e-mail accounts, you get free website hosting for your business: 1GB of disk space for your website, with modern and easy to use cPanel and easy WordPress installation.